Yes, when I was a little girl, I read “Alice in Wonderland”! And I have loved her ever since. There have been untold printings of this whimsical, nonsensical book … and, of course, numerous movies, tv specials, plays, even comic books; but I had no idea how popular she really was until I started selling tea-related “Alice in Wonderland” items. It was almost impossible to keep them in stock. One evening a desperate father called and asked me if I could possibly ship overnight 12 cups and saucers for his little girl’s Alice in Wonderland themed tea party the next day. From teapots to mugs, jewelry, figurines, books, you name it, Alice fans were and are passionate collectors. This year marks the 150th anniversary of Alice’s Adventures in Wonderland. Written in 1865 by Charles L. Dodgson under the pen name, Lewis Carroll, this charming, fairy tale-like story follows a little girl by the name of Alice as she falls through a rabbit hole into a world of fantasy and illusion, populated by the most fascinating characters. 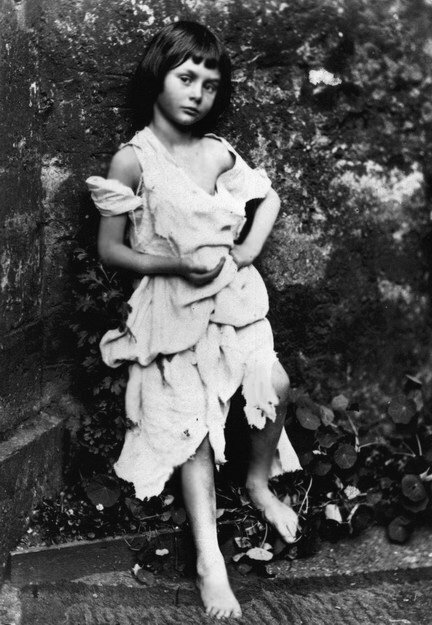 Alice Liddell dressed as a beggar. Photographed by Lewis Carroll (1858). Legend says that in 1862 on a boating trip with the Liddell family for an afternoon’s outing, 10-year old Alice Liddell asked Charles Dodgson (aka Lewis Carroll) to entertain her and her sisters with a story. Dodgson (32, was already a published author, poet, illustrator and photographer), created a fantasy tale of a little girl named Alice, and the adventures that followed after she fell down a rabbit hole. The origin of how the Liddell family befriended Dodgson are a little sketchy. One report says Dodgson had become friends of the Liddell family while photographing the Christ Church Cathedral in Oxford where Alice’s father, Henry, was the Rector. Another says Liddell’s father was the Dean of Christ Church College in Oxford, where Carroll was a math student or professor. However they met, Dodgson was a family friend and had told many tales to Alice and her sisters, but this time he actually made Alice the main character. Alice was so delighted by this nonsensical world of rabbits in waistcoats and playing card gardeners, she pleaded with Dodgson (aka Carroll) to write the story down for her. It took Carroll months as he carefully penned the story, illustrating it with his own pen and ink drawings. 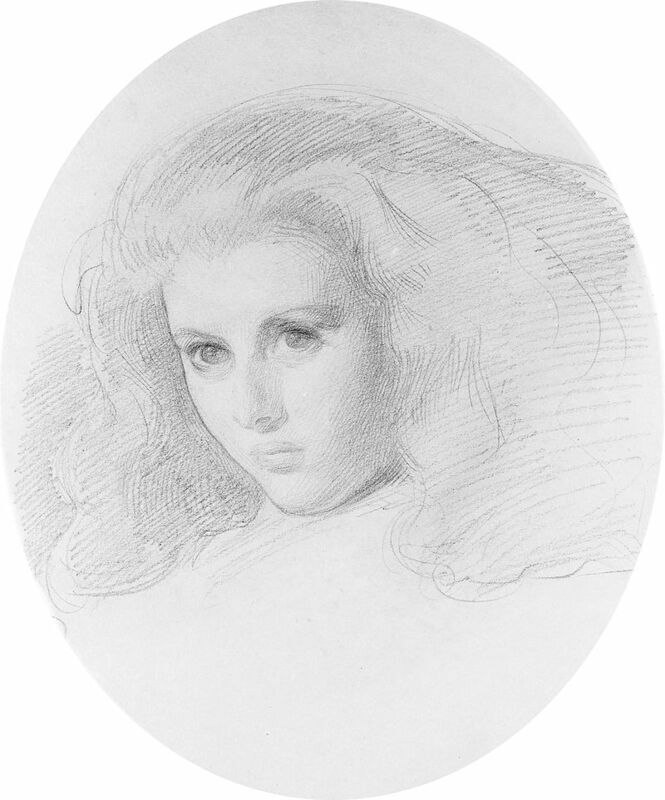 Although the story is said to be for Alice, with her short cropped dark hair, it appears that Carroll used Alice’s sister, Edith, as the model for these illustrations. Dodgson was an exceptionally gifted and talented man. Some might say he was also cursed with demons. He won many awards as a mathematician and scholar. Under the name, Lewis Carroll, he was a published author of short stories and poems. In addition to his writing and illustrations, he was a very respected and influential photographer, but gave up photography entirely in 1880 for some unknown reason. The success of Alice’s Adventures in Wonderland made him known around the world. Since being written in 1865, Alice’s Adventures in Wonderland has never been out of print, and has been translated in more than 170 languages. Today, only about twenty copies of the first printing are known to survive. In 2009, at the Profiles In History auction house in California, a copy of the original book, which actually belonged to 10-year-old Alice Liddell, was sold for $115,000. Also auctioned was an extremely rare first edition, which sold for $40,000. To celebrate this milestone anniversary, the Morgan Library and Museum in New York City has on exhibit the original manuscript of Alice (on loan from the British Museum), as well as original correspondence, unique drawings, hand-colored proofs, rare editions, vintage photographs, and some other very important objects associated with the story. Alice: 150 Years of Wonderland will be on view at the museum through October 11th. If you happen to be in New York City between now and October 11th and are as avid a fan of Alice as I am, I’m sure you’ll enjoy this 150th anniversary celebration! And the next time you sit down to a pot of tea, be sure to pay homage to the Mad Hatter, the Dormouse and the March Hare! It is, after all, their anniversary as well! Refererences: The Famous People Society, Wikepedia.org, Paste Magazine, The Morgan Library and Museum.